Worried About Product Safety? How About Worker Safety? A couple of months ago I went with a girlfriend to a shopping mall, finally giving in to her demands that I get a decent wardrobe. My torn jeans and baggy t-shirts embarrassed her when we went out together in public. Her pleasure at my apparent submission and a day of shopping were short-lived, however, when she tried to take me into GAP. Uh, uh, I told her, Sweat shops in Central America. Rolling her eyes to the ceiling she suggested we head into a sports shop to replace my worn out sneakers with some Nikes. Are you crazy? I burst out, Havent you heard of child labor in Viet Nam? Wondering if a boyfriend like me was really worth the trouble, she insisted I should at least get some Levis in another store to replace the jeans I had on. For the rest of the afternoon we argued about whether it made any difference at all to boycott stores and products with a bad human rights record. What difference did one more sale make, my girlfriend argued, I only bought clothes once a year anyway and I wasnt going to change the world by looking like a slob. She insisted on going for a coffee to calm down and I had to bite my tongue as we entered Starbucks a lecture on environmental devastation might have been the final straw. Americans are lately up in arms over the safety of imported products, but as I tried to explain to my female friend, it cuts both ways -- the workers who produce the toys, clothes and household gear are in much more danger than the consumer who ultimately buys the products. Consumers may be stuck with shoddy goods but workers' lives and health are endangered by inhumane working conditions. 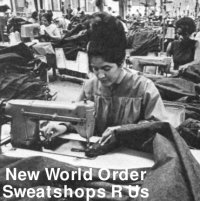 Sweatshops have been around for almost as long as the sewing machine, becoming a real social phenomenon at the height of the industrial revolution in the mid 1800s. As the masses in Europe migrated from the countryside to the cities (a trend occurring today in the developing world where most sweatshops are found), labor was cheap and easy to get. If one tanner died of chemical fumes today, another could be got tomorrow and no questions were ever asked. Workers slaved away for 15 hours a day and got paid by the piece. And forget health or dental plans. Gradually and despite the efforts of the sub-contractors and middlemen workers in Europe and the U.S. began to unionize and fight for better conditions. Their squalid and dangerous conditions were made public by investigative journalists and eventually governments were pressured into regulations. You know, stuff like making employers actually pay their workers and not beating them around the head when they fell asleep on a 16-hour shift. As standards of living in the U.S. rose, it was no longer really viable to get rich by employing children to stitch clothes or by forcing people to work unpaid overtime and so companies began to look overseas. Nike, for instance, fled improving work conditions in America in the 70s and based its factories in Taiwan and South Korea. Wouldnt you know it but troublemakers began campaigning for living wages there too, and so they up and moved to places where phrases like human rights are an in-joke with government officials -- places like Viet Nam, Indonesia and China. Now in the age of globalization, theres hardly a major corporation that doesnt outsource some of their business to the developing world. From call centers in India to garment sweatshops in China, labor is cheap and the governments give the companies a free hand. After all, its just business. Nothing personal. A friend of mine recently took some business classes in his Masters program at UC-Santa Barbara and I could hear the disbelief in his voice when he told me about it on the phone. We had this one class on business ethics, he told me, It lasted all of five minutes. Everyone just agreed that there were no ethics in business. Of course, nowadays, leading sweatshop offenders of the past like Wal-Mart and Nike would disagree. After more than a decade of intense lobbying by protestors home and abroad, the big corporations have wised up to the CSR dollar thats Corporate Social Responsibility. As Nikes spin doctor, Hannah Jones, puts it, fair trade isnt just "a risk and reputation management tool but rather a business objective. Nike, the company thats all heart. And Nike's not alone. While none of the corporations that have profited immensely from sweatshops in the past (Levis, Gap, Wal-Mart, Disney, to name but a few) ever claimed responsibility for the working conditions of their products, theyve all sought to clean up their public record. Whereas in the past they blamed excesses like sexual and physical abuse in the workplace, unpaid overtime and industrial accidents on their sub-contractors, the corporations now all have nice CSR policies that win them the approval of the mainstream press and woo an increasingly ethical public. It's nonsense. They've just tuned into what all the business schools are doing in teaching reputation management. You want to dress up this CSR and put it in the best possible light. With enough money to pay production teams to put together a glossy, paternalistic company image and enough influence with the media to make sure the word gets out there, the multinational corporations can appear any way they choose. They appoint some inspectors to check that conditions in factories in China are humane and leave it at that. I have a friend who goes to Beijing to get things made. Small production runs of new products can be made to a professional standard at a fraction of the cost of doing it back home. When I asked him what working conditions are like in the factories he just shrugged as if to say hed already resigned himself to spending several years in Purgatory. When I suggested the likes of Wal-Mart at least send investigators to make surprise visits to check the working conditions, my friend just laughed at me. Listen, he said, the factories are falling over themselves to make the cheapest bid they can. The only way to do that is to cheat the poor immigrant peasants on the production line. They keep fake books to show the inspectors and no one is ever any the wiser. He went on to tell me that theres even a new industry of experts who coach subcontractors on how to fool the CSR inspectors who come around. They run through the kinds of questions that might be asked and tell them what kind of answers the corporations want to hear. "We've come to realize that, while monitoring is crucial to measuring the performance of our suppliers, it doesn't per se lead to sustainable improvements. We still have the same core problems." So should we give companies like Nike a break and buy their running shoes anyway? Hell, at least theyre trying is it their fault if those wily Chinese manufacturers play these kinds of games. Factory managers conclude correctly that if the brands were truly serious about improved working conditions, they would pay enough to make it possible for those conditions to be achieved." So why do the workers take it? Isnt it up to them to fight for the kinds of rights that Americans have? Why should American corporations take the responsibility for corruption and slovenly health regulations in other countries? Namely because they choose to invest there. And every time that working conditions improve and the hourly wage creeps up, the corporations up and move in what activists call "a race to the bottom." By ensuring starvation wages and degrading working conditions, countries become more attractive to foreign investment and the government officials get all kinds of kickbacks along the way. And when workers do successfully demand the rights that are promised to them by the glossy CSR program, it often backfires. Take the Dominican Republic where workers at a company called BJ&B; making baseball caps for Nike made a stand they demanded an end to insults from their supervisors, no more compulsory overtime and the right to go to the bathroom when they wanted to without fear of losing their jobs. They even formed a union. Nike applauded their struggle, put pressure on the factory to live up to the glowing CSR program and then, when no one was looking, moved their baseball cap operation elsewhere in March of this year, leaving all those newly-empowered workers without jobs. Hey, thats why NAFTA was passed in the first place. Plenty of workers in places like El Salvador ready to work for $4 a day. My concern is not that there are too many sweatshops, but that there are too few. The factories provide some basis of education and training, a steady income and the opportunity to specialize in what they do best, he continues. Not that Im much of an economist Sachs would leave me feeling pretty foolish within a few minutes of debate, Im sure but I know Id feel a little better if he would himself volunteer a few weeks on, say, a Nike production line in Viet Nam, getting paid a few cents for each sneaker he puts together, threatened with violence for wanting to go home after a few hours of overtime and then waiting months to get paid. After all, being overworked, abused and exploited is what workers in the developing world do best. So what has all this got to do with you? The first thing is that it might trouble your conscience to know that of the $70 you just paid for your new top, only a dollar or so went to the person who actually made it. It might also rob a little of the glamor of your new sneakers to know that the person who made them cant afford new sandals and gets their toes trodden on by their supervisors if theyre too long on their bathroom break. The problem here is distance. If you could stroll into a nearby shop and see the employees being treated like this, chances are you wouldnt go back. You might even try and do something about it. But when its happening on the other side of the world and in a language you dont understand, its out of sight and out of mind. Or how about a little self interest? All the jobs that are being sent overseas are jobs that could have been done by Americans. And if it wasnt such an easy option to pay sweatshop wages in Asia and Latin America, then wages in the U.S. would be higher without the unfair competition. Consider, too, that exploitative working conditions in places like El Salvador, Honduras or even Mexico mean that the dream of coming to earn a real wage in the U.S. ensures that thousands head north every day to try their luck crossing the border. There would be no need to build a wall across the Mexican frontier if people could earn a decent living in their home countries. And if people in disaffected Asian countries werent being exploited by American corporations, would there be quite as much anti-U.S. feeling as there exists today around the world? Would people be as ready to blow themselves up in public places if they could afford to support their families in the first place? So what can you realistically do about it? Governments ought to take action but its not likely to happen any time soon. Companies could make changes but theyre just making too much money to stop outsourcing to poor, corrupt countries. In the end, if there is any hope, its in the hands of the consumer. Buy locally made goods or those that carry the Fair Trade sticker. Hassle companies for information on where your clothes come from. And, if you want to be sure of buying ethically, avoid any company with a bad record on sweatshops. Its impossible to prove anything but the odds of them having made significant changes are low. Big corporations really are in it only for the money. In a world where we get to vote for one of two candidates at every election and spend the rest of our lives trying to get food, shelter and a little love along the way, your purchasing dollar is perhaps your most realistic option when it comes to changing the world. Spend it wisely ... and humanely. Tom Glaister is the founder and editor of www.roadjunky.com - The Online Travel Guide for the Free and Funky Traveller.